This screen capture from an interactive map by the National Wildlife Federation shows spill incidents along the Enbridge Line 5 pipeline. Advocates with the National Wildlife Federation say they’ve uncovered more oil and gas spills from Enbridge’s Line 5 than they previously thought, raising questions about how leaks are reported and whether there have been more. The group said Monday it has found at least 29 instances of oil and natural gas liquids spills totaling more than one million gallons over the course of the pipeline’s 64-year history. That’s nearly double the amount the group previously thought had occurred. The 29 spills, which were mostly detected by the public and local government personnel rather than the company’s remote pipeline detection system, date back to 1968, according to a map of the data. 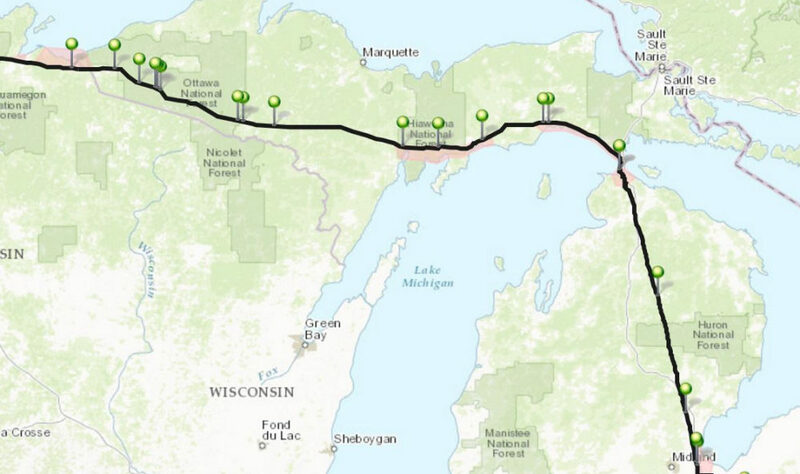 The group also says its findings shed light on the history of Line 5’s inland path — which runs from northern Wisconsin to Sarnia, Ontario — while much of the attention has focused on the underwater section beneath the Straits of Mackinac. Some of the earliest documented spills date back to 1968, including a 300-barrel incident in the Upper Peninsula. Beth Wallace, pipeline safety specialist with the National Wildlife Federation, began tracking spills along Line 5 in 2011. Around that time, she discovered 15 incidents that were reported in the federal Pipeline and Hazardous Materials Safety Administration’s database. Wallace said the federal agency, which is a part of the U.S. Department of Transportation, in recent years began tracking incidents in spreadsheets, making it easier to determine where spills have taken place. “That flexibility in the spreadsheet allowed us to uncover 29 spills included in the map,” she said. However, Wallace conceded that there could be more that were missed in the federal database based on the complexity of finding them. Wallace said there is a range in the type of spills that occurred, from manufacturing or construction defects to more incidental issues at pumping stations. Enbridge spokesperson Ryan Duffy maintained that the spill information has been publicly available all along and downplayed incidents that have taken place at the company’s facilities along the route. “Enbridge builds safety into every step of pipeline construction and operations, and many preventive measures are taken to promote the safe, reliable operation of our oil pipelines and related facilities,” Duffy said in an email. Those measures include various pipeline coatings, 24-hour monitoring from a remote center and regular ground and aerial inspections. However, those figures are vastly different from what the National Wildlife Federation found. The group counted 14 incidents since 2002 totaling roughly 27,000 gallons released. But Wallace said those releases “very much should be” included in the total amount of incidents. “Pumping stations and other above ground equipment, along Line 5, would not be in operation without Line 5 and those parts of the system are as much of a risk to the public and our environment as the below ground equipment,” Wallace responded. The latest findings come on the heels of reports this year that question Line 5’s integrity in the vulnerable Straits of Mackinac, and add to further criticism about the company’s history in Michigan, where it had the largest inland oil spill in 2010. Last month at a meeting by Michigan’s Pipeline Safety Advisory Board, Enbridge sought to ease public concerns about whether the protective coating had deteriorated in parts of the Straits, despite an internal report suggesting otherwise and that prompted state officials to call for more explanation. Advocacy groups say the state has been unwilling to take action to close the pipeline in the Straits despite repeated findings that the company has violated an easement agreement with the state. A Republican U.S. representative and a Democratic U.S. senator from Michigan introduced legislation earlier this year calling for a shutdown of the pipeline if a study shows it poses significant risks. A Republican state lawmaker has also re-introduced similar legislation this year. The National Wildlife Federation also filed a federal lawsuit in January against the U.S. Department of Transportation, its secretary and the Pipeline and Hazardous Materials Safety Administration over Line 5’s spill response plan. In June, a pair of highly anticipated studies are scheduled to be released that detail the extent of the risk posed by Line 5 in the Straits as well as what alternatives exist. More broadly, the National Wildlife Federation is concerned that there may have been more pipeline spills along Line 5 than have been previously known by the public, even if the company has known about them all along.